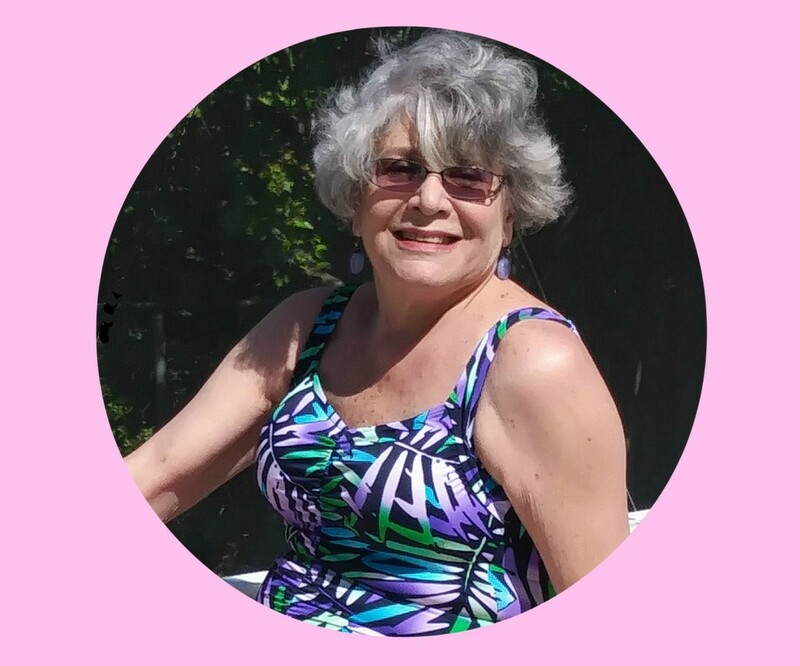 I am a two-time breast cancer survivor. 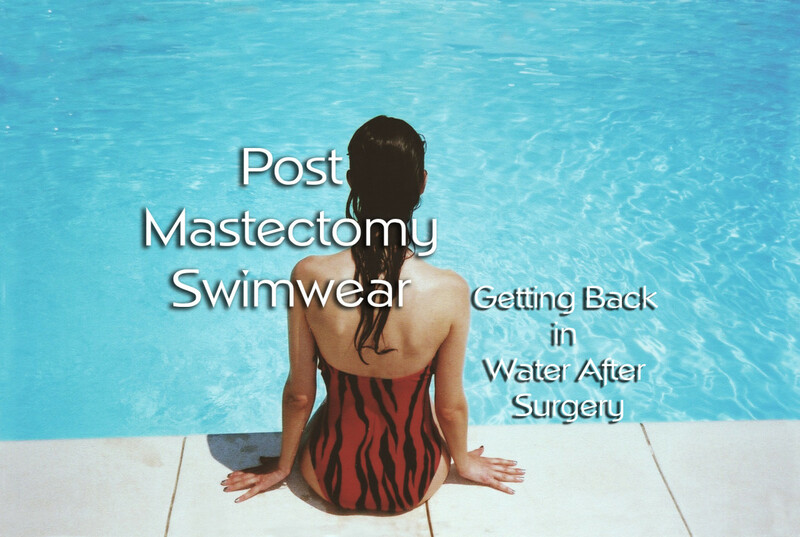 The second time, I had a total mastectomy. I hope to help others by sharing my experience and ideas. I was scheduled to go on a cruise about six weeks after my mastectomy, and I was determined not to cancel the plans I had made six months prior to my diagnosis. The problem was finding a swimsuit and breast forms to use with it. 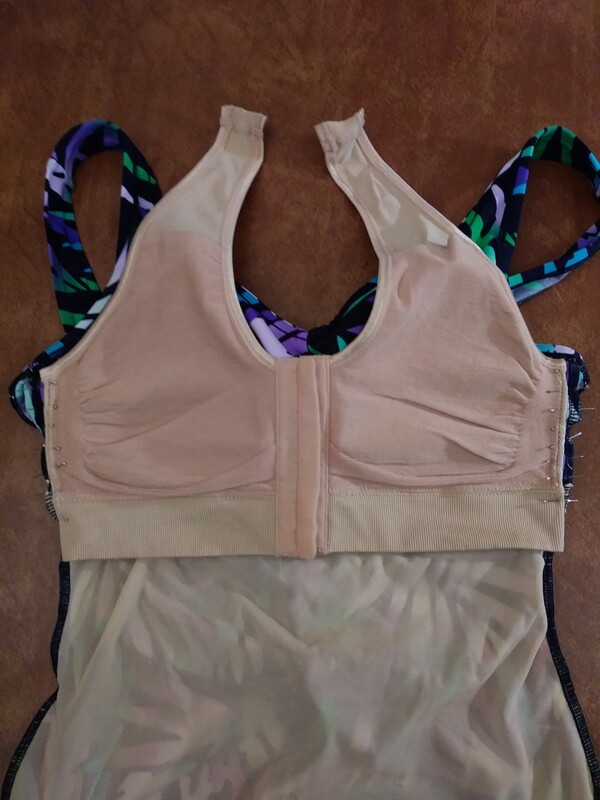 Medicare had paid for my post-mastectomy prosthesis items (special bras and breast forms to insert inside the “pockets” built into the cups of these bras). However, the breast forms made for the prosthetic bras cannot be used in the water. And since Medicare does not pay for swimwear solutions, cost was going to be a major consideration. I looked online for solutions. 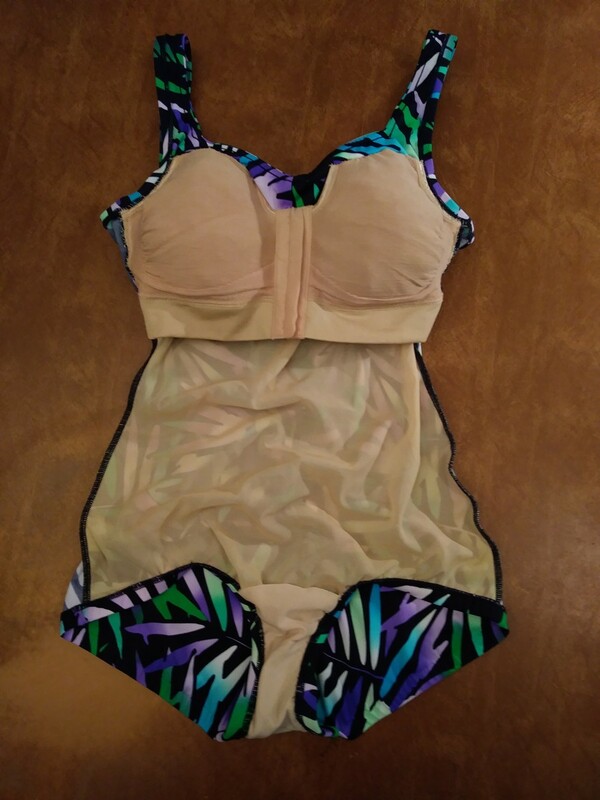 I found mastectomy swimsuits that looked very stylish. They differ from regular swimsuits in that they have a pocket so a breast form can be inserted. I found nice ones for around $100. I don’t do much swimming these days so it didn’t make sense for me to spend $300 for something I would only use a few times a year. Plus, I had some brand new swimsuits sitting in my drawer that I had bought in anticipation of the cruise. I was determined to use those swimsuits. I looked online for a solution, but I didn’t find anything that was both cheap and easy. I found a creative solution that used the swimsuits I already had. The other materials I needed I already had on hand or they could be bought inexpensively. 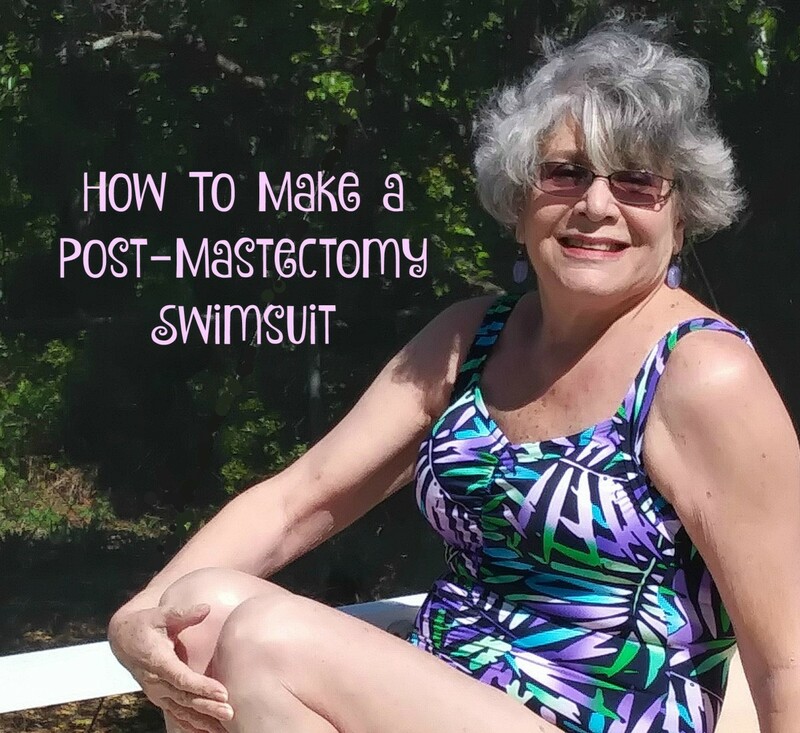 You can make this post-mastectomy swimsuit in 1 to 2 hours. My solution was to sew a “Miracle Bamboo Comfort Bra” into my swimsuit. 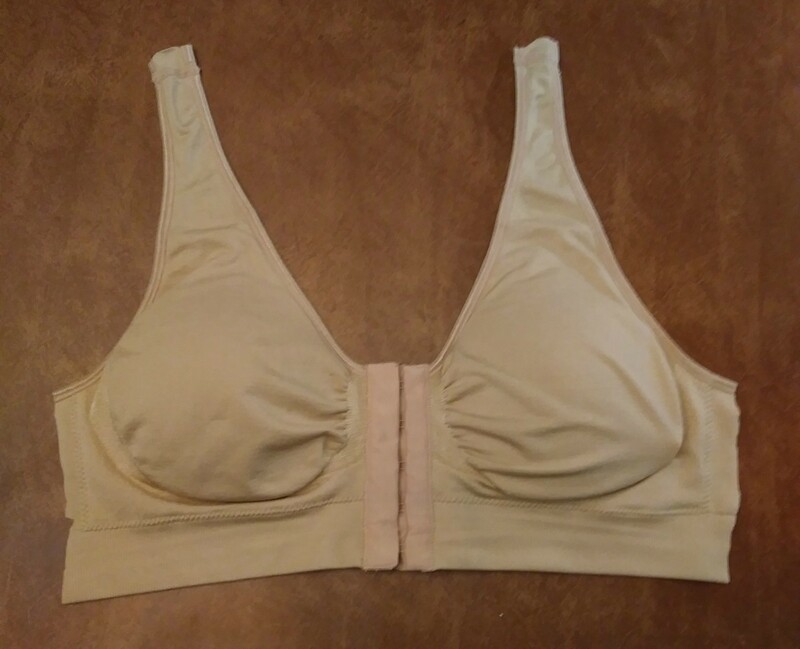 This is a bra made of a lightweight stretchy fabric with an elastic band (No underwires.) It has a pocket on the underside of the cup and a thin foam “shaper” that fits inside the pocket. I already owned a couple of these. I used to wear them around the house or whenever comfort was more important than looks. If you don’t already own one of these, the good news is that they are very inexpensive. I bought mine in Bed and Bath and Beyond for $15.00. (Actually, only $12 because I had a 20% off coupon.) They are also available on Amazon. If you buy one, buy the size you wore before your mastectomy. If you are buying a new swimsuit, buy the size that matches the swimsuit. This is the comfort bra that I used to make my post mastectomy swimsuit. You can buy it on amazon or in other retail stores. It is made with a comfortable stretchy fabric that is perfect for sewing into your swimsuit. It comes in all sizes. It is also inexpensive. You may find other comfort bras, but I think this one is best because it has a front closure. This keeps the cups separate and at the correct distance from each other. If you already own a different brand of comfort bra, make sure it is made of stretchy fabric, has pockets in the cups, has thin foam inserts for shaping, and has a center area to keep the cups separate. The next problem was how to stuff the cups to get a natural look that would keep looking natural even when wet. I wandered around WalMart looking for a solution. When I spied a bin of nylon mesh shower balls, I knew I had the solution, a very cheap solution. They were only $2.00 each. I have also seen these in Bed Bath and Beyond in a pack of three for $6.00. Amazon also sells these shower balls for about $8.00 for four. Note: I find it useful to pin things together before I sew them together. Also if you are not confident about the placement of the comfort bra, sew it with a long basting stitch using thread of a contrasting color. You can later sew everything with a matching color and remove the basting stitch. Begin by getting everything ready, all the materials and the swimsuit you intend to modify. First cut the comfort bra just outside the side seam leaving about a half inch of the back attached. Cut the straps just above the seam.at the top of each strap. (You’ll trim the straps later). Don’t worry if the cuts are not straight. The excess material at the side will be turned under along the line of the seam. When you turn the swimsuit inside out, the molded cups will be exposed. The band just below the molded cups is the end of the shelf bra. 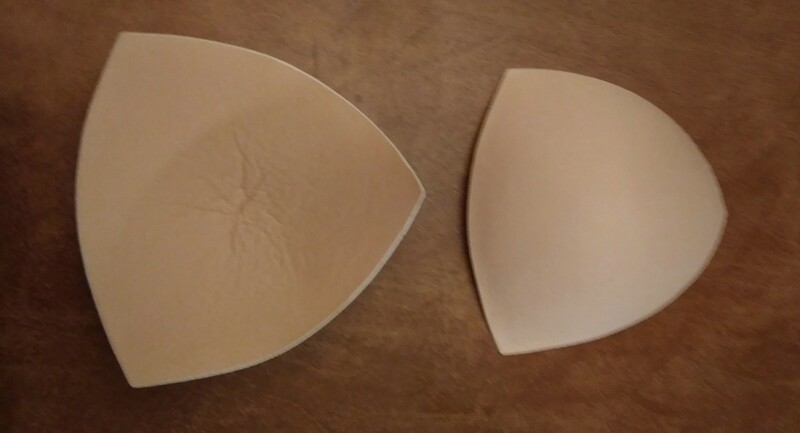 Push the shelf bra cups so that they are concave. Lay the comfort bra over the shelf bra with the closure (the hooks and eyes) of the comfort bra facing down (towards the front of the suit.) Fold the extra fabric of the comfort bra under at the side seam so it won’t show when the side seams are stitched together. Pin the side seams of the comfort bra to the side seams of the shelf bra. The armhole of the comfort bra should lie along the armhole of the of the swimsuit. The center of the comfort bra should be below the center of the swimsuit. Don't worry about the straps. You’ll deal with that later. 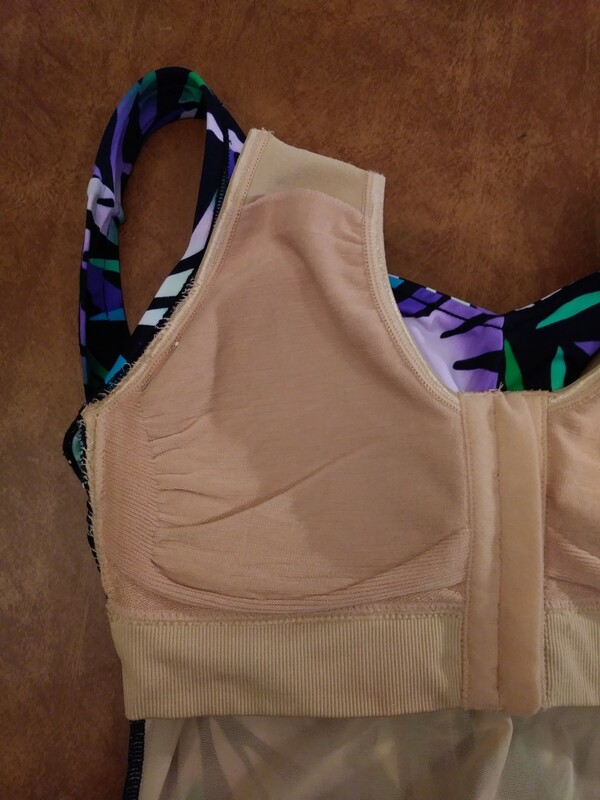 Sew the comfort bra to the side seams of the swimsuit using an overhand stitch. Use a piece of thread about 4 times longer than the seam. Double thread the needle by pulling the thread through the eye of the needle and then knotting the two ends together so that you are sewing with a double thickness of thread. When you sew, don’t let the needle go through to the front of the swimsuit—you don’t want the stitches to show on the front of the suit. You will only be sewing into the seam area. Start at the armhole and work your way down removing each of the pins when you are about an inch above the pin. Sew all the way to the way down to the bottom edge of the shelf bra. If the comfort bra is longer than the shelf bra, just let the extra part hang free. Cut the straps off above the pocket hole, but be sure to leave enough of the strap so it can be folded over later to close the pocket hole. Punch the swimsuit cups of the shelf bra down and fit the cups of the comfort bra into them. Sew the outer edges of the swimsuit and comfort bra together along the armhole. Take one shower ball and cut off the rope in the center of the ball that is there to hang the ball.. Dig your fingers into the center and find the cord that holds the ball together. Cut this cord and pull the ball apart. You will have a long wavy ribbon. Do the same with the second shower ball. You can't use the ball as it is. I tried this and it looked very unnatural, like I had stuffed a tennis ball into my swimsuit. Insert one edge of the nylon mesh ribbon into the pocket opening at the top of the comfort bra . The foam insert should remain in the cup of the comfort bra and with the rounded side facing the front of the swimsuit. The ribbon is stuffed so that it rests against the side of the comfort bra that will be placed against your skin when you wear the swimsuit. As you stuff, arrange the ribbon to fit the shape of the bra. Make sure to put a little stuffing into the area near your armpit. Your real breasts extended into that area also. Keep stuffing until you have the amount of fullness that you want. You may not use all of the ribbon. Let the end of the ribbon hang free for now. Use a second shower ball for the other side. The swimsuit will look like the puffiness is on the wrong side (the inner side). However, when you wear the swimsuit, it will flatten out against your skin and all the fullness will be in the front where you want it. Try the bathing suit on. Remove some of the ribbon or add more until you have the look you want. Check to make sure everything fits and looks the way you want. Make any changes you feel are needed. 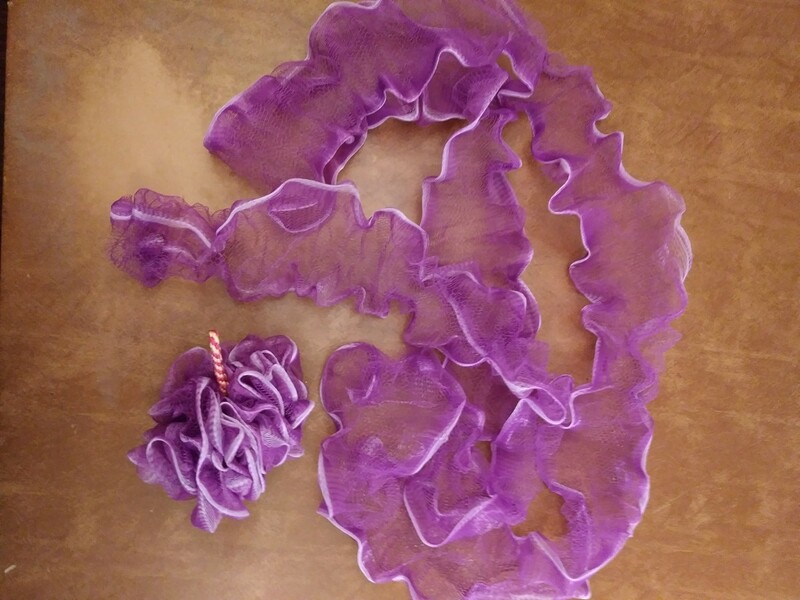 Cut the excess ribbon if you have any or get more ribbon from another shower ball if you want more fullness. It won’t matter if it is not a one continuous ribbon. When you are satisfied, the final step is to sew the edge of the pocket closed. You don’t want any ribbon falling out. Fold the edge of the excess part of the strap into the opening of the pocket bra. Sew the strap of the comfort bra so that the pocket is sewn closed and the bra is sewn into the shelf bra. Continue stitching the top of the comfort bra to the top of the shelf bra along the line of the molded cup of the shelf bra. I didn't stitch all the way to the center, but I suppose you could if you feel it works better for your particular swimsuit. Your swimsuit is now ready to wear. You might think that it would feel scratchy, but you won't feel anything but the smooth fabric of the comfort bra. Before I wore my swimsuit in public, I tested it in the shower to make sure it would look good wet. (If you have a backyard pool or lake, you could test it there.) Then I hung it to dry to make sure it would hold its shape. You might want to test yours to be sure everything will be fine. I wore the swimsuit on my cruise. I tested it in the ship’s pool by doing an hour of water aerobics–jumping, walking, running, and twisting and stretching every which way. I even wore it in the hot tub. The swimsuit passed every test. It was wonderful to look the way I looked before I had the mastectomy. Care for your modified swimsuit just as you would any swimsuit. Rinse your swimsuit in cold water after each wearing. Gently wring out excess water. Hang it by the straps on a hanger. It will dry overnight. 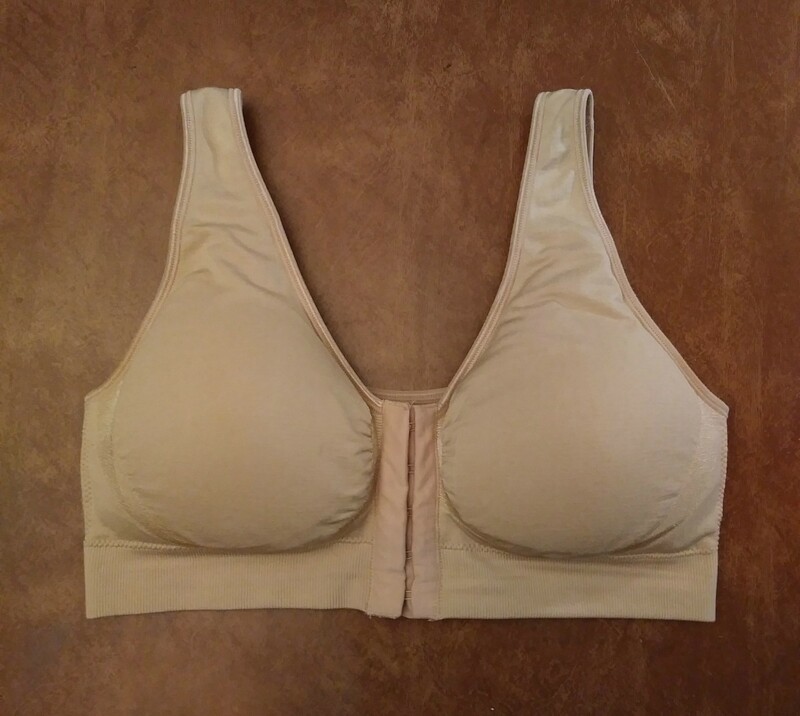 You can use the comfort bra to make an everyday post-mastectomy bra.If you can’t afford the prosthetic bra and breast forms or if you find them too uncomfortable, this will make a fine substitute. I use mine for around the house or for my bike and gym workouts. 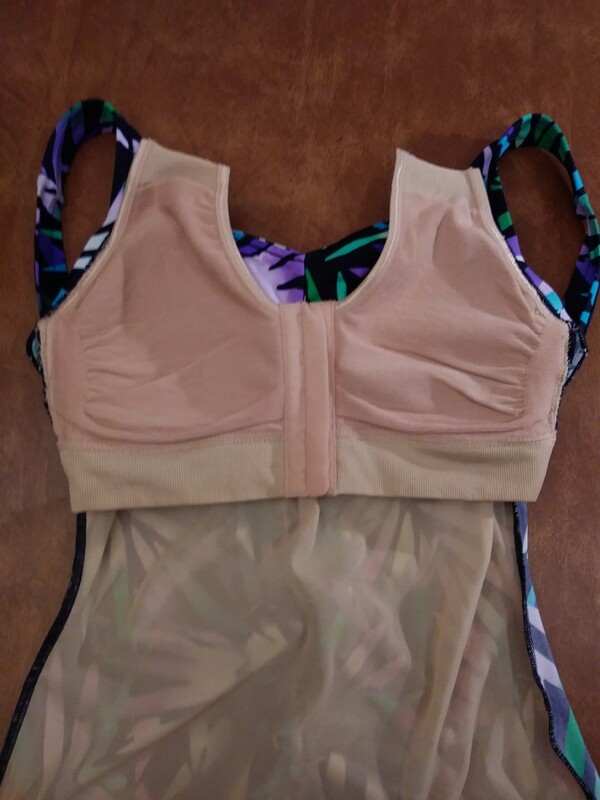 Just stuff the comfort bra with shower ball ribbon as you did for the swimsuit, leaving the insert in place with the rounded side facing the front of the bra to ensure a nice shape to the cups. When you have the look you want, sew the opening closed. Viola! You now have a comfortable post-mastectomy bra with a convenient front closure. It’s very inexpensive and you can make it in 15 minutes. I made this simple bra stuffed with ribbon from a shower ball for everyday wear. You might be able to wear the modified swimsuit since the swimsuit is only worn for a short period of time. Consult with your doctor about this. Please comment. I'd love to know how this worked for you for you. And I hope you will share your own ideas. Wow Catherine!.... Thank you so much for sharing! This has been a problem for me as I go swimming most days and have played around with various solutions which were not exactly successful, unless I went the expensive way. The bath net is a great idea! I had to rush off and try it in my swimmers immediately. I think this is going to be a winner!! I didn't have the bra but a polyfibre filled soft insert from my left side mastectomy in 2011. I have sewn the insert into my swimmers and filled it with the bath net. Just did a fashion parade for my hubby who is very impressed with the result. I am so confident with it I will give it a trial run at the pool tomorrow. I will also pass on your link to my breastie buddies at out next get together. Thank you so much Catherine. Cheers from Helen in Australia. Carol F: Please come back and share how it worked for you. Thanks for the idea! I will be doing this soon, not yet cleared for swimming. Dianna Mendez: I'll be immodest and say I think I came up with a great solution. If you know anyone who needs this please send it on to them. Thanks so much for your comment. This is such a nice article on an issue that many women experience. You have created a very lovely suit that solves a problem for others. Larry Raskin: Thanks for your comment. Perhaps there is a women in your family or among your circle of friends who might be interested in this idea. Though I can't understand your situation on a firsthand level, I am inspired by your enginuity and resilience. Mary Wickerson: It sounds like you followed my driections to make your own suit and that it worked for you. I'm so glad to learn that others can have the same success with this idea that I did. Your suit turned out great. I was a little worried when I saw the image of the bath net but it works. So glad it passed the test on your cruise. Kudos to you. Doris James-MizBejabbers: I wish that everyone who had cancer had as easy a time of it as I did. I hope my bathing suit design helps others to accept what is necessary and then be creative as they move on in their life. Thanks for your kind words. Catherine, you looked very nice in your swimsuit photo. I didn't know that you were a cancer survivor and I salute you and all other ladies who have survived this dreaded disease. Thank you for empowering them with encouraging words and easy to follow instructions.This is very ingenious and money-saving. I'm all for empowerment! You GO girl! 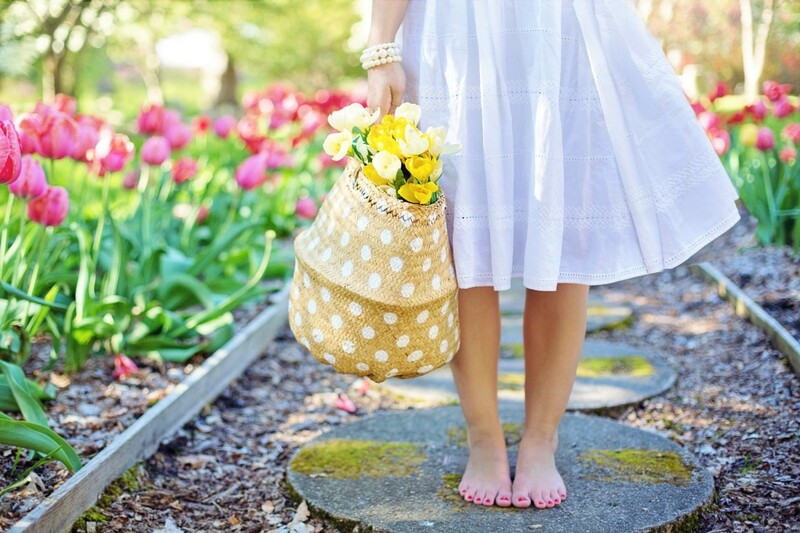 FlourishAnyway: Thanks for your good wishes. I outed myself because I don't want to feel that I have to be ashamed about being flat-chested. I want to empower other women. By the end of the day, I hope to have posted another article explaining this in more detail. Sally Gulbrandsen: Thanks Sally. I'm happy with the decisions I made about having surgery without reconstruction. When I told my surgeon during a routine post-operative viit about this, she told me she wants to share this with her patients. That is such a neat idea and so helpful for people who have chosen not to have implants after surgery. I will definitely be sharing this with a few ladies I know.